I’ve been designing some heatsinks for the open-source charge controller project. The circuit contains a diode and a MOSFET, which could potentially have up to 20A flowing through them. In this case they will get hot and will eventually fail. I need to ensure that they will be kept within their specific working parameters by keeping them cool. This is done with a big lump of metal, usually called a heatsink. In this post I’ll go through my design calculations to design a heatsink for an example system. The lifetime of all semiconductor devices is inversely proportional to their operating temperature. For reliable operation and long component lifetime, it is vital to ensure adequate removal of heat from the device. Within a switching device, there are two main losses: resistive and switching. Both will increase the temperature of the switching device. The resistive element is an I2R loss due to the current through the device and its ‘on’ resistance. Heat is also generated each time the device is switched, due to its IV characteristic. This loss is proportional to the switching frequency. This diagram is taken from my PhD report. The input current, voltage and the switching frequency are used to calculate the power dissipation requirements. The heat transfer paths within the device can be obtained from the component data sheets. If the device must be insulated from the heatsink then an additional layer is introduced. Careful attention must be paid to the implementation of any applied insulation. Mylar insulators with a silicone heat-transfer compound or special silicone insulators can be used. The silicone heat-transfer compound must not be applied too thickly or it will add to the heat transfer resistance. Finally, the heatsink must be correctly sized for the required power dissipation. 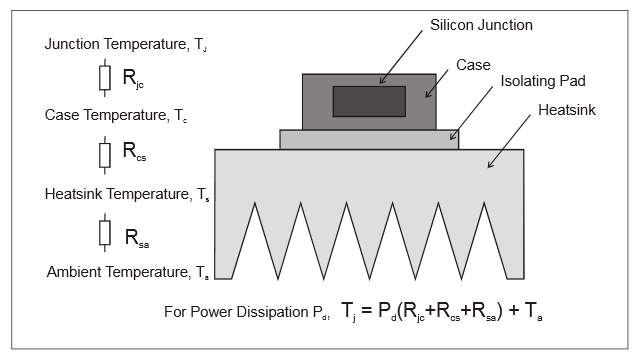 The temperature of the junction, Tj, must be kept as low as possible as it will affect the component lifetime. The data sheet specifies a maximum junction temperature of 150 ºC but a value of 100ºC was used in the calculations to allow some headroom. They have up to 20A flowing through them. We first need to calculate how much power is being dissipated in each device. The diode power dissipation is due to the current flowing through the device and the forward voltage drop. To minimise the forward voltage drop I am using a Schottky Rectifier diode, which will have a lower forward voltage drop than other diode types. According to the data sheet for this device the forward voltage drop is: 0.51V at 20A. This equates to a power loss of 0.51V x 20A = 10.2W. (Note that at 12V DC, this would be 12V x 20A = 240W, 4.2% of the total power generated). MOSFETs dissipate power due to I2R when they are on. I have chosen a MOSFET with a low value on resistance, which is, according to the datasheet: 14.8milliOhms. This equates to a power loss of 20A2 x 0.0148ohms = 5.92W. (Note that at 12V DC, this would be 12V x 20A = 240W, 2.5% of the total power generated). where CRSS is the MOSFET’s reverse-transfer capacitance (a data sheet parameter), fSW is the switching frequency, and IGATE is the MOSFET gate-driver’s sink/source current at the MOSFET’s turn-on threshold (the VGS of the gate-charge curve’s flat portion). From the datasheet we find that the and CRSS = 95pFthat IGATE = 0.5A (this was an approximation, from the Vgs of 5V at switch on). From out design parameters we know that the PWM switching frequency is 400Hz (from the Arduino output), ILOAD = 20A, VIN = 12V or 24V. Hence the power dissipation due to switch is 0.0002W at 12V and 0.0008W at 24V. These are VERY small values. If the switching frequency is increased then these witching losses would become a much bigger proportion of the power loss. Or I have done the maths incorrectly. So the total maximum power dissipation, Pd, is 10.2W + 5.92W + 0.0002W = 16.12W. We will be using the equation: Tj = Pd (Rjc +Rcs + Rsa) +Ta, where Ta = 25C, Tj = 100C and the values of Rjc and Rcs come from the device data sheets. We need to perform this calculation for the two different devices, the diode and the MOSFET, but with only one junction from the heatsink to the ambient, as we will be putting both devices onto the same heatsink. We are trying to find the value Rsa which can be used to specify the heatsink. From the data sheets we can find that, for the diode: Rjc = 1.5 C/W and for the MOSFET: Rjc = 1 C/W. In the design I am working on, the case for the diode and the case for the MOSFET are at exactly the same potential, so it does not matter if they are electrically connected. I will be using heatsink compound, so the value of Rcs = 0.5-0.8 C/W, we will use the worst case which is Rcs = 0.8 C/W. We now have everything we need to calculate the value of Rsa which can be used to specify the heatsink. Now we know the minimum Rsa value for our heatsink for two different temperatures. Any heatsink with a thermal resistance value lower than this will be suitable. Heatsinks are quite expensive and heavy. I need it to work reliably, but there will not be many times the unit is operating at 20A. Hence I will design for a value of 5.63 C/W or lower. This should reduce the size and cost of the heatsink required. When looking for heatsinks we need to look for a heatsink with a thermal resistance lower than our design value. this will ensure it can dissipate the required amount of heat. In this case I am designing for 5.63 C/W. All heatsinks have a C/W (sometimes a K/W, but the same thing) rating. This can be used to decide which to choose.